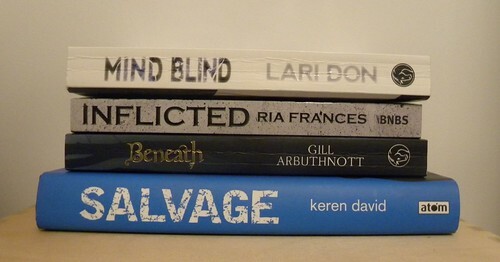 I found all four shortlisted authors – Gill Arbuthnott, Keren David, Lari Don and Ria Frances – in the lounge part of fth, and chatted to Keren and Lari, who repeatedly checked with me whether I knew the other one. Introduced myself to Gill, and we decided we had actually spoken before. I even ended up talking to the Provost, who’s at the end of his second five year stint of provosting and attending book awards. 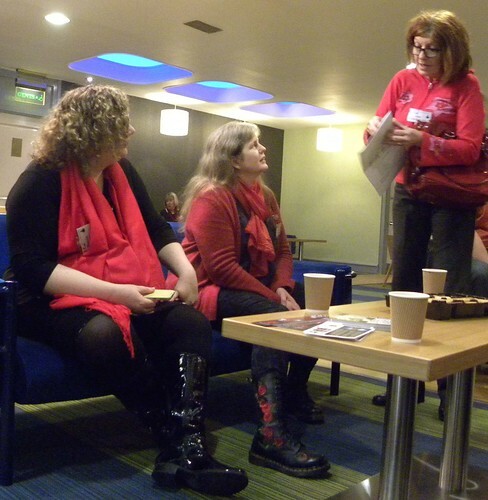 Agents Lindsey Fraser and Kathryn Ross had braved Gertrude to be there for their authors. 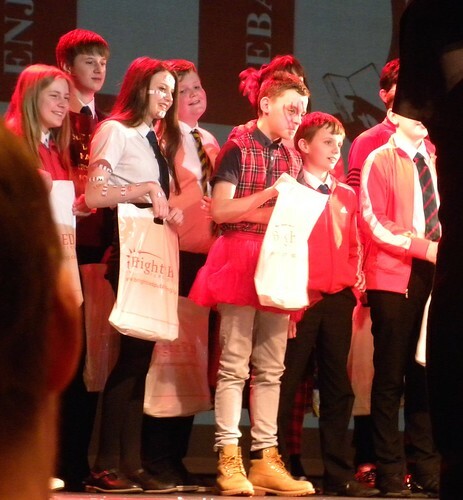 When it was time, Yvonne started things off, wearing tartan tights and red skirt and a special RED 10 t-shirt. Red noses were found under chairs and prizes handed out and more prizes promised. Ten schools in nine other countries had been sent the shortlisted books to read, and some of their comments were read out. 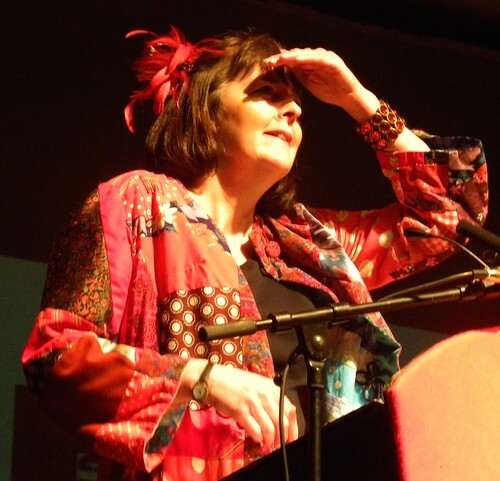 The prizes for the best reviews were handed out, the overall winner’s review was read aloud, Yvonne swirled round in her magic red coat and Provost Reid hitched up his trouser legs to show us his red socks. So it was all quite serious stuff. We had a coffee break (you need this when the award takes all day to be awarded). We discussed lukewarm hot drinks (don’t ask! ), I let Lari use my very tiny Swiss Army scissors, and I returned to my seat to find the school behind me having ‘spilled’ their drinks on my row of seats. I think we can assume a good time was being had by all. The authors’ turn to entertain came next. They each had three minutes to say something profound. Gill said she made her character Jess to act braver than she was. 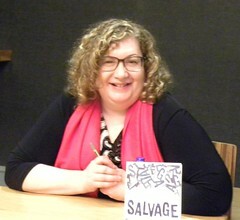 Keren mentioned that she’d had a completely different end in mind for Salvage. Ria’s book got written at night, when she suffered from insomnia, and she told us about Albert Göring, who was a better guy than his brother. Lari explained how surprised she was to find herself writing a YA book, which she’d never expected to do. We had a second round of dramatised books, and I decided on the spot that the one for Mind Blind was by far the best, and it had a lovely cardboard van for kidnapping characters in. There was at least one flying potato and an amusing kelpie. Lunch came next, and I managed to sit with and chat to Keren and the Provost, with Lari and her agents joining us after a bit. I believe Lindsey had a dog to walk first. I learned a lot about Falkirk, and politics, from Provost Reid who, while proud of his town, could understand why my first time (in 1973) I took one look at the place and left again. 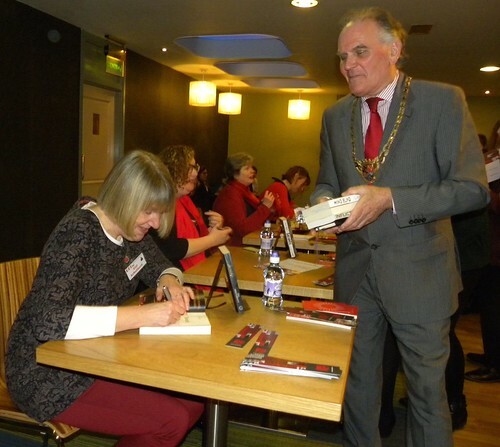 After they’d eaten, the authors had books to sign, with long queues snaking in front of them. Even the Provost queued up. More prizes. 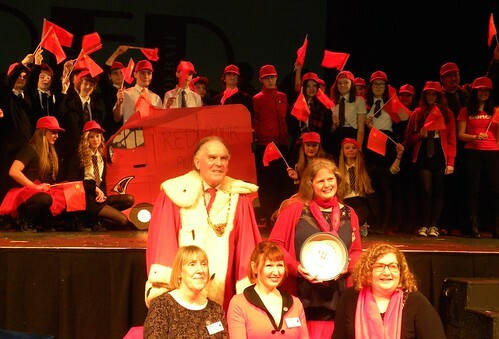 Prize for best dramatisation, prizes for best red clothes. Apparently someone even wore red contact lenses. 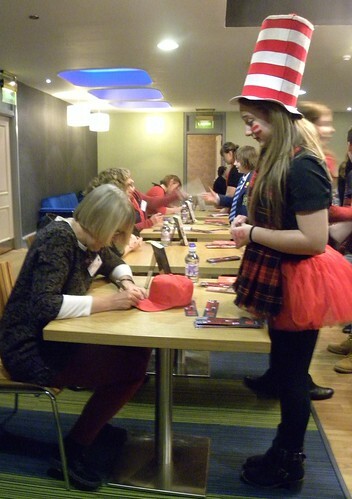 My favourite was the boy in the red tutu, but the Cat in the Hat girl was very well turned out too. Getting closer to the big moment, but first Yvonne had to be thanked, so she ran away. (She is a bit crazy like that.) Provost Reid entered in his official – Father Christmas style – outfit, red all over, and flowers had to be handed over to Barbara Davidson who made the prize, and the press photographer also got flowers, and as the Provost waved the large red envelope around, he thanked the ‘shy and retiring’ Yvonne for her hard work. 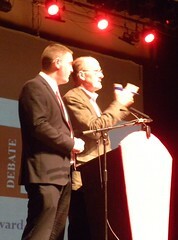 Organised stamping from the audience. Lari’s unprepared speech was admirably short and sweet, just the way we want it. 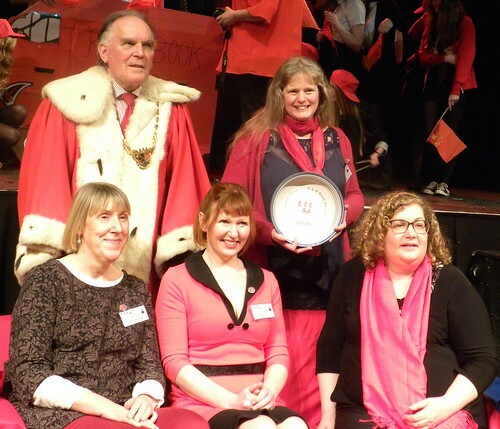 Before the authors were spirited away, there was a lot of posing for photographs, with the prize, and the Provost, and the little red cardboard van. I got on my broom and headed home. The sandbags were at the ready. Falkirk Town Hall seemed safe enough, but you never know. Storm Gertrude had threatened to do her worst, which in my case was only half a train service. Luckily one had one’s Resident IT Consultant to convey one (sorry, that hurt even me) to Falkirk on Friday morning, where the ladies below were ready to fight it out to see who’d emerge the winner of the 10th RED award. 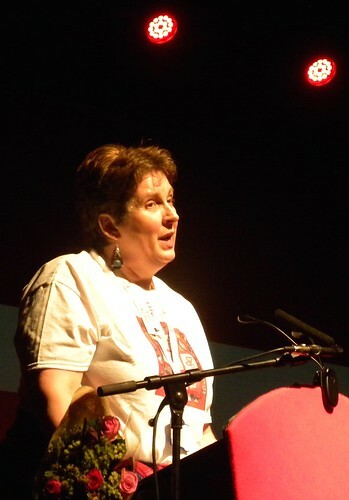 Caroline Lawrence has written a story to inspire girls that they can do more. Admittedly, the cover features a beautiful girl with a bow and arrow, and I understand that recent films (and the books behind them) have made bows and arrows the thing to have. But why not? 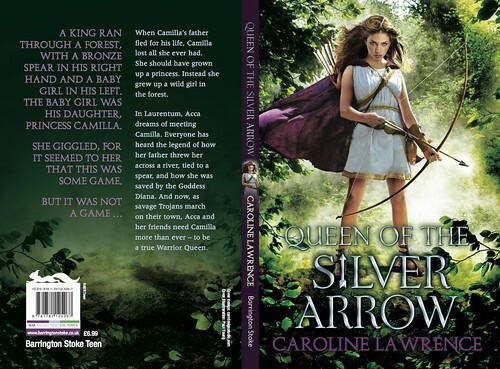 This re-working of Virgil’s The Aeneid for Barrington Stoke tells the story of Camilla, who is the Queen of the Silver Arrow. Her father, who’s a King, brought her up in the woods where he fled with his baby daughter, and she learns to be of service to the Goddess Diana. Camilla’s story becomes well known in the neighbourhood, and Acca who is the same age, dreams of being like her, and so do some of the rich girls in town. Eventually they all meet and Camilla trains the girls to be warriors, something that becomes necessary when the Trojans arrive. Violent and bloody in parts, it’s still a beautiful piece of history (it was real, wasn’t it? ), and as I said, very inspiring for girls. It needn’t all be about getting married. Or at least not without doing something worthwhile first. Sometimes we all want to be like an Amazon, although perhaps stopping short at baring a breast. Time to rejoice! For only the second time ever, a children’s book has won an award in direct competition with so-called ‘real,’ adult books. 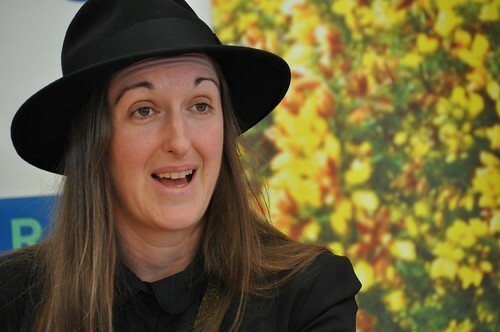 I’m very pleased for Frances Hardinge who won the overall Costa award on Tuesday, for The Lie Tree. I have not read it, which primarily is because no one sent it to me. I have not read any of Frances’ books, but keep hearing so much good about them. I will try to get hold of a copy, and while I do, I wish Frances all the best, and much fun spending the £30,000. It’s what I call a pretty decent reward. Statistically it must be wrong that children’s books don’t win more often. I had more or less given up hope that any other writer after Philip Pullman would ever win the ‘big’ Costa award. I rationalised it by thinking that Philip’s books appeal to adult readers as well (not saying other children’s books don’t or shouldn’t). I mean those who are not far-sighted enough to realise that children’s books are the best. Judging by the delighted reactions online from her peers, they are happy for Frances and for children’s books as a whole. If it could happen twice, there is every reason it might happen again. And everyone who has read The Lie Tree (and they are many) say what a great book it is. 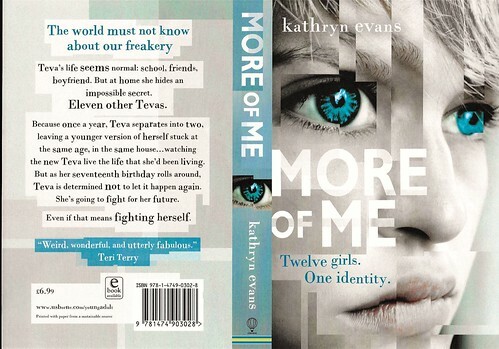 Kathryn Evans’ debut, More of Me, is as marvellous a story as I had hoped for. The concept is very slightly off-putting, to be honest, but it makes perfect sense when you read the book, and it is of the unputdownable kind. You might want to give it a go. Teva is 16 and has a best friend and a boyfriend and she likes school. At home she has her mum, as well as a dozen copies of herself. Every year a new Teva emerges from the ‘old’ Teva’s body, looking the same, but a year older. The discarded Tevas remain at home, staying the age they were when they were the ‘real’ live Teva. Fifteen is really angry with her successor, who has her life, her best friend and her boyfriend. For the earlier versions of Teva, it’s been longer and they are used to it. But the new Teva is determined she will not be a victim to this annual change into someone else. She wants to stay alive and out there, enjoying the boyfriend Fifteen found and fell for. This kind of plot nearly does your head in. Is it real? How can it be? Is Teva crazy? Is her mum crazy? And whatever the answer is, how can this end well? In fact, how can there be an end, with Teva after Teva emerging? The answer wasn’t what I’d imagined, even though any imagining was quite difficult. But the concept is both fascinating and has a lot of reality about it. I’m not the same person I was at ten or 46 or whatever. We change, while still being mainly the same as we were. I’m just grateful I don’t have a few dozen younger Bookwitches hanging around, giving me attitude. Authors’ letters are drying up, it seems. Maybe they were a luxury, anyway, and now it’s all many can do to keep their heads above water, writing things that might pay. On the other hand, there is nothing actively wrong with emails. Paper can burn, while cyberspace could be lost in, well, cyberspace, as it were. Anything can disappear, but most things can also last surprisingly well. The article touches on one published volume of letters, which I’ve already blogged about. I did some more research on what they said, and decided that I was possibly slightly misinformed back then. But so were they. I believe the letters were from the author to ChocBiscuit’s father’s first wife’s first husband’s mistress. Rather than the other way round. Tove Jansson is mentioned by someone who met her, many years ago. She astounded her companion by saying she read every letter, and replied to them as well. This someone wrote to Tove afterwards. He never had a reply. As I said, I’ve got a small email archive here. If I save emails, it’s either because I might need to remember what someone said. Or because they wrote so well that I like keeping it. I very much doubt that I will publish any books off the back of my collection, however. So please continue writing. Daughter should be on her way to a Harry Potter character. Or is that the Swiss village? You Google Grindelwald and you get the option of one, or the other. To be on the safe side, I went for both. I’m not enough of a nerd, either way. It’s obvious that Grindelwald is a place name in the German-speaking world. You don’t have to know where. At this time of year it’s a fair guess that it will be snowy. Because I am not all that Harry Potter-nerdy, I can’t say I remembered much about any character called Grindelwald either. In one ear and out the other, so to speak. Daughter thought it was amusing. That she was going there, not that I’m useless and forgetful. But thanks to other Harry Potter fans it’s easy to find out. There is a whole wikia, where I assume you can look up anything at all, when you are as forgetful as I am. Which is good. I now know more about Gellert Grindelwald than I ever needed to, and what worries me is how many other characters I might have forgotten as they left the page. I can’t help thinking how much fun J K must have had when naming her people. I have no book and no characters, but I have an urge to go through atlases and reference books to find outlandish sounding [Swiss] villages to name them after.